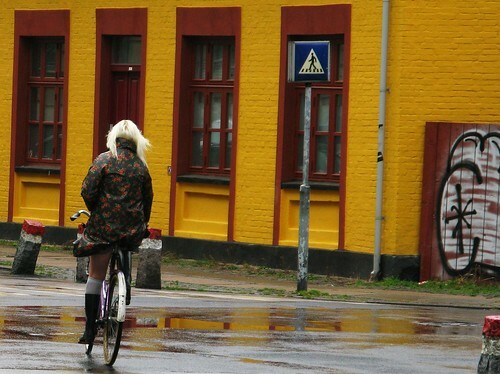 A quiet cycling moment on a drizzly autumn day. nice ride huh.. :-) but she ride with that outfit, is she comfortable with it? @ denparser: Of course she is comfortable with it. Cycling doesn't require any special outfit. It is just about getting on your bike and out there. I'm quite sure Mikael agrees with me on that. of course I agree. just open your closet. it's filled with cycling clothes. anything you can walk in you can cycle in. Hehe, this kind of discussion never ceases to surprise me. I still don't see how you do it. I ride to work in the rain. I am a complete mess when I get there. Soaked, cold and miserable. It is impossible to keep stuff dry. And then there is the grime that splashes up from everywhere. The clothes are covered with it. They're called "fenders" (or "mudguards" if that's the way you swing). It is required that they be of the type that is actually designed to fend mud though. There's also something called "moderating your speed" so you don't kick up as much grimy water in the first place. I don't mean to sound snide (although I recognize that I do, otherwise I wouldn't have said, "I don't mean to sound snide. "), but that really is about 90% of the game. This is one of those photos that reminds me that B&W is NOT the ONLY medium for art photography.